“I’m an 81 years old man, and if I remember correctly, I initially noticed tiny growth(s) in my nostrils. They were annoying more than painful. After a few days, my nose and face became swollen and painful (7 on the pain scale3). That was the day I first saw my dermatologist. 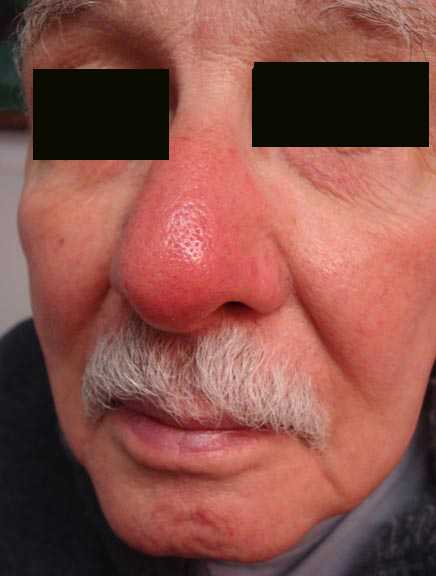 He made a diagnosis of the “Rudolph Sign” and prescribed 2% mupirocin ointment. After four days of treating with mupirocin it was no better. It had become much more swollen, discolored, and even more painful (9 on the pain scale). I saw my dermatologist gain, and it was decided that MRSA was a factor. (A few months earlier, I had been in hospital for atrial fibrillation and a routine nasal culture showed MRSA. It was not treated). After careful search to find an antibiotic that would not affect my Coumadin, the best choice seemed to be minocycline 100 mg twice a day. I had only taken a single dose before I was taken to the emergency room at North Adams Regional Hospital for another bout with atrial fibrillation. While in the ER I experienced very severe pain (10+) in my nose, cheek, and forehead. My nose was so painful that I could not wear my glasses. I was treated with Vicodin that proved to be helpful. Once admitted, I was administered vancomycin intravenously for two days until it was determined that my problem was not MRSA related. This was based on the negative culture from the dermatologist’s office that was taken after three days of intranasal mupirocin; so, he is not sure about the validity of that culture.) I was then given minocycline, as had been prescribed earlier, and there was some improvement. Now, several days after discharge from hospital, slow improvement continues. There is still some swelling. When warm compresses are applied, fluid is secreted from the tiny open wound at the tip of my nose. I have no pain now. 2. My case as presented on VGRD. 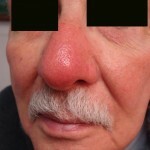 This entry was posted in Anonymous and tagged MRSA, nasal infection, nasal vsstibular furunculois, red nose, Rudolph sign, Sontheimer, VGRD by humanemedicine. Bookmark the permalink. Thank you for posting this important case. Reading patient’s own words made me feel like I was sitting there and actually listening to him. I’m glad he started feeling better but having gone through the hospital experience and pain on the nose itself are very painful to imagine. Learned a lot from this patient’s story.